CRU WiebeTech digital forensics tools are relied on all around the world for data capture. Investigators use our products to clone or study hard drives, but they also use our storage products to securely store the data they capture. EFS e-Forensic Services provides support for navigating data capture guidelines, specializing in forensically sound data capture with end-to-end security for the client data. On behalf of their clients, often law firms looking to build a case that will need to be admissible in court, they first turn to CRU storage like our encrypted DataPort 10 Secure to house and transport the highly sensitive cloned drives. 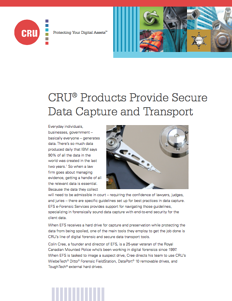 Download the case study to read more about how EFS uses CRU storage to provide safe and secure data transport during every step of the data capture and analysis process. This entry was posted in Desktop Storage, Portable Storage, Removeable Drive, Digital Forensics, Data Security by H.G. Blakeman. Bookmark the permalink.